Because, you know you want the biggest, baddest one there is. There are a lot of advantages to the SWM-32 multiswitch. It gives you the ability to run 32 tuners off a single multiswitch, and you can add a second SWM32 through the ports on the bottom. That’s 64 tuners of DIRECTV power at your fingertips! Not only that but the multiswitch’s extra power output will give you a stronger signal down the line, meaning up to 250 feet of cable between the switch and the receiver. Whole-home is a real pain. If you want to share programs between receivers, you will find it’s an uphill battle. Each output line from the SWM32 can support 8 tuners, and you can’t share programming between output legs without putting in a lot more equipment. You’ll need to power the dish. 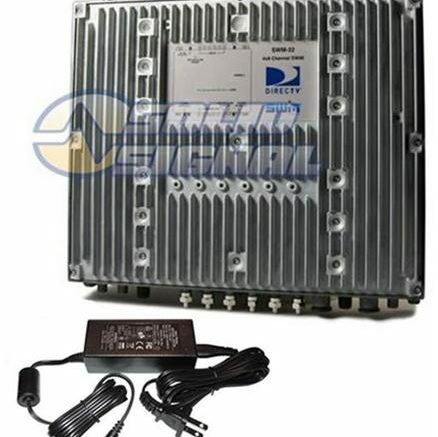 Unlike other multiswitches, the SWM32 does not power the dish unless you add an additional power supply. We recommend using a polarity locker instead of a second power supply because the SWM32 really does work better when a polarity locker is used. You’ll probably also need a signal amplifier. The SWM32 is designed to be used with a trunk amplifier with adjustable gain. It’s sensitive to a signal that’s too weak or too strong. That’s yet another expense added to an already expensive project. So what to do instead? For home users, we recommend using SWM-16 multiswitches instead, along with approved splitters. This is an easier configuration and also less expensive. We have a whole tutorial on how to do it.